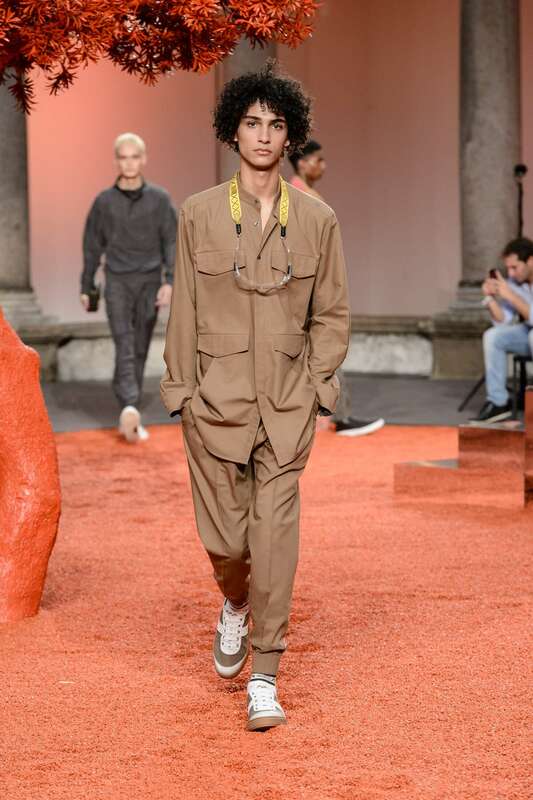 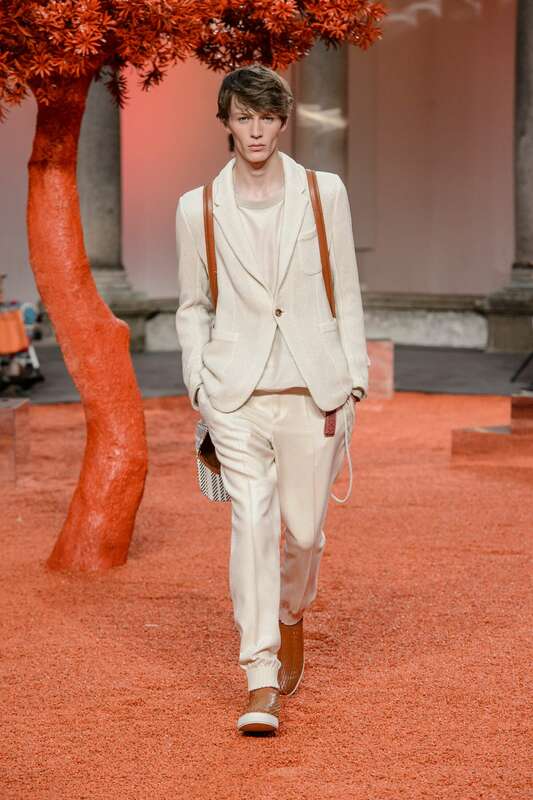 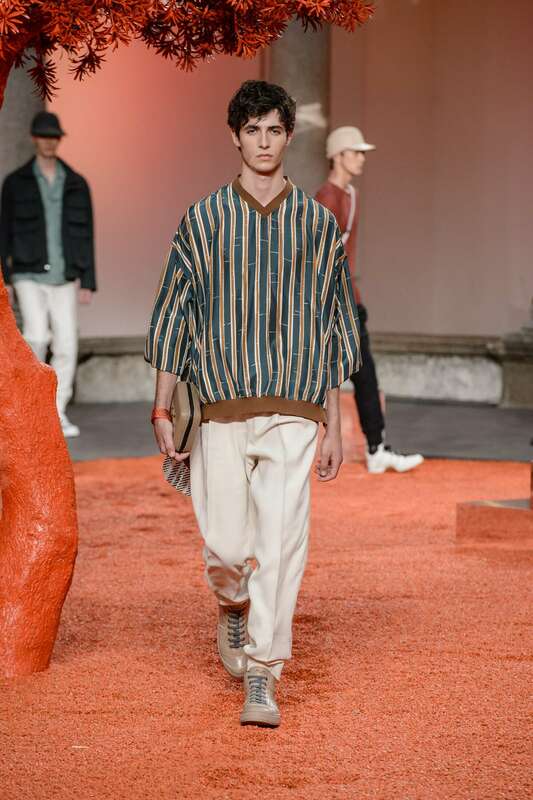 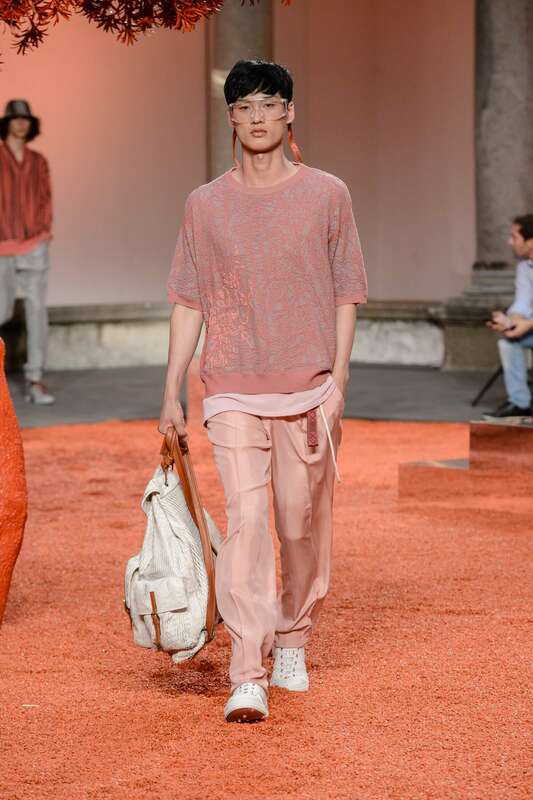 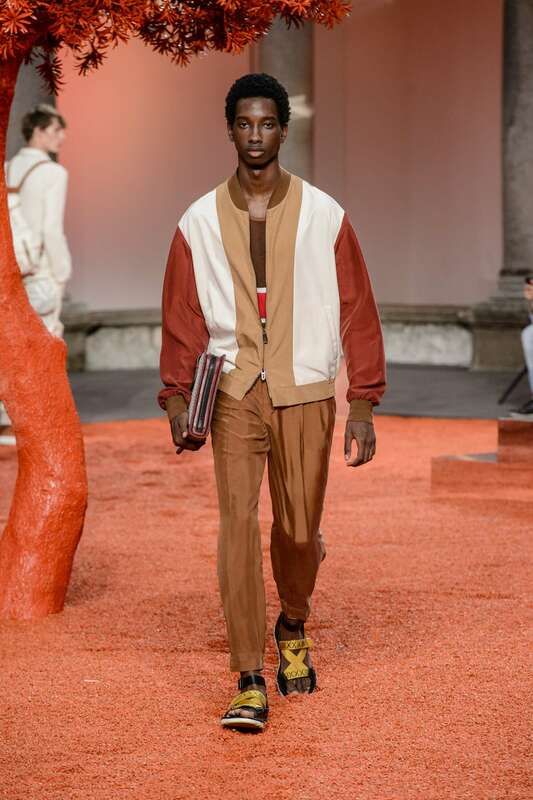 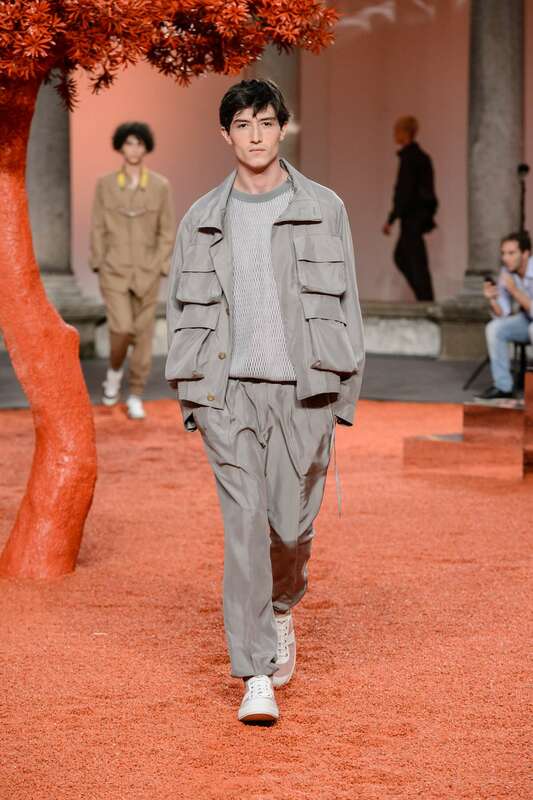 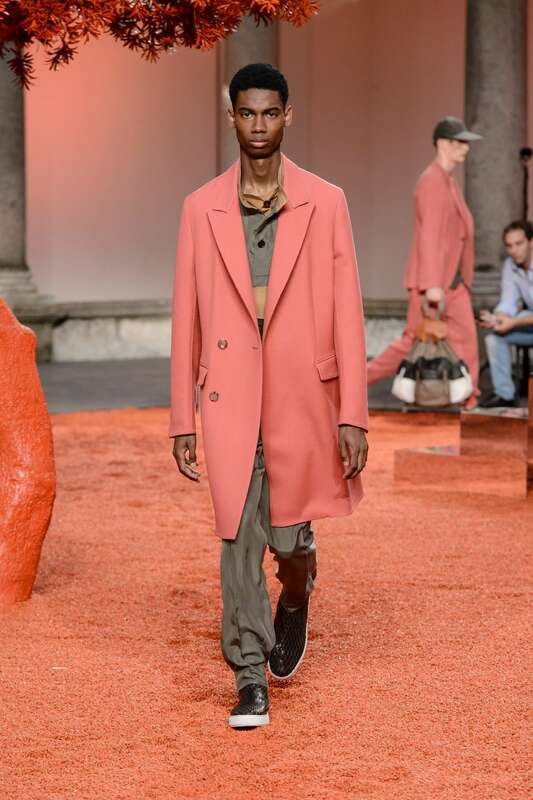 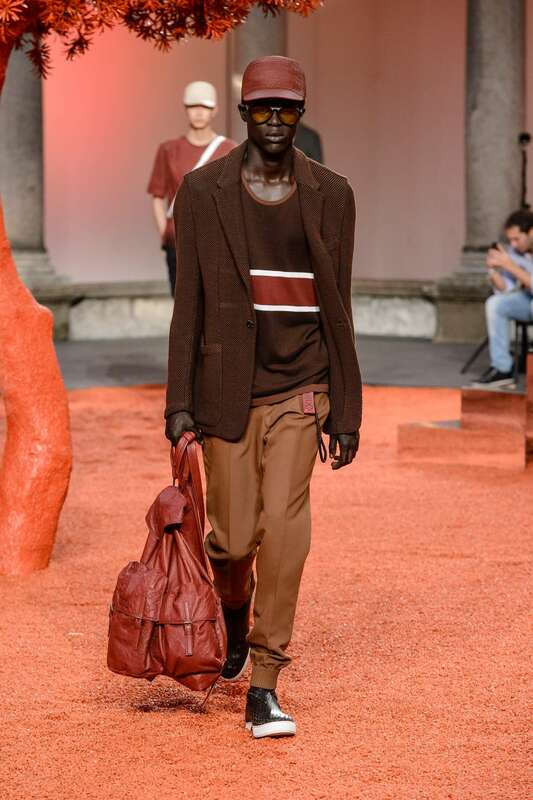 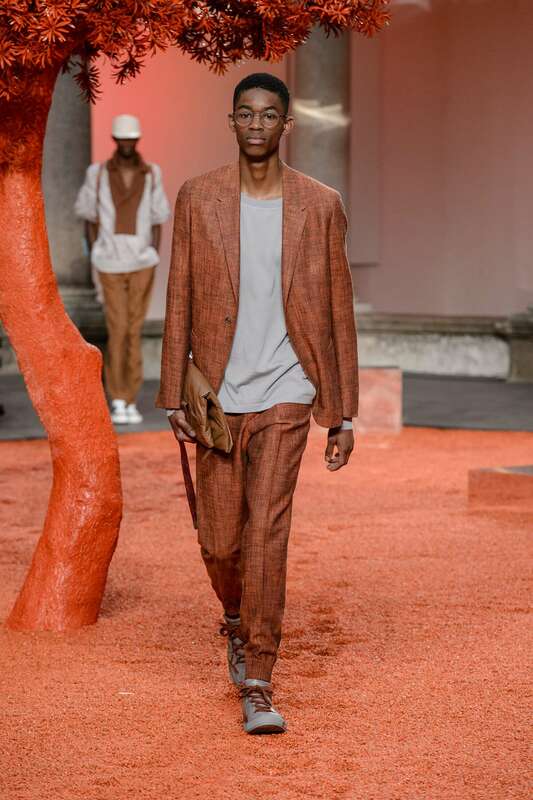 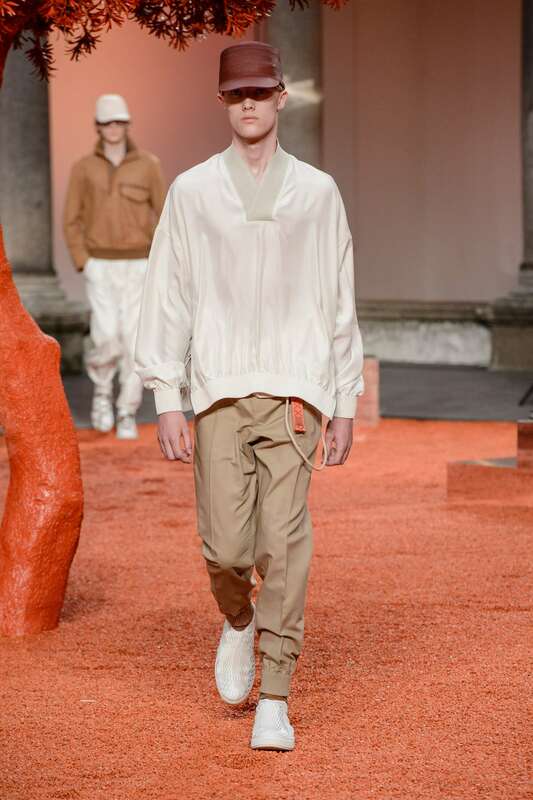 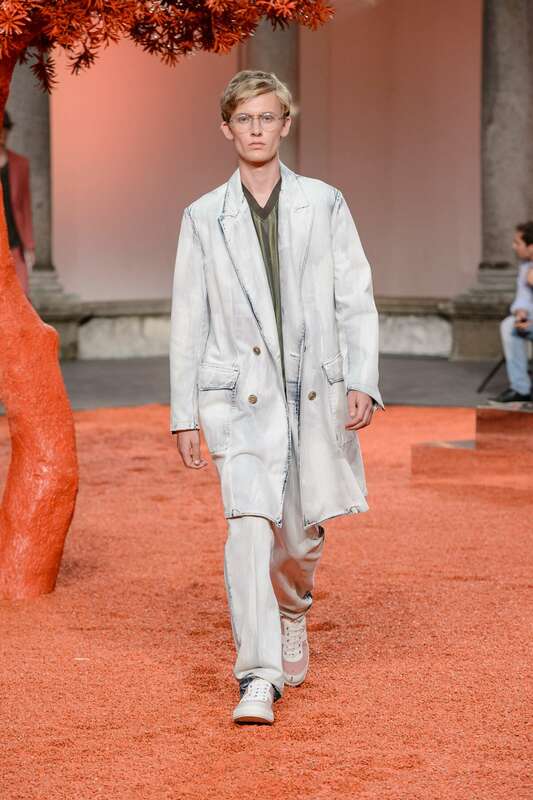 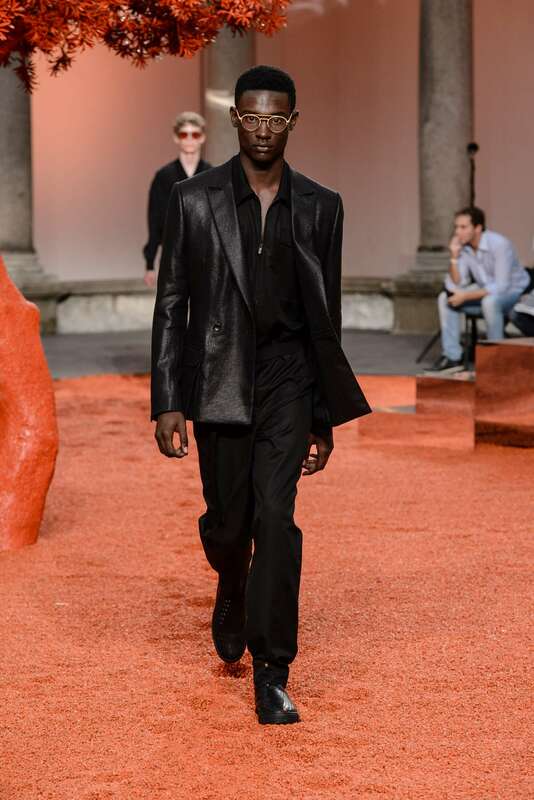 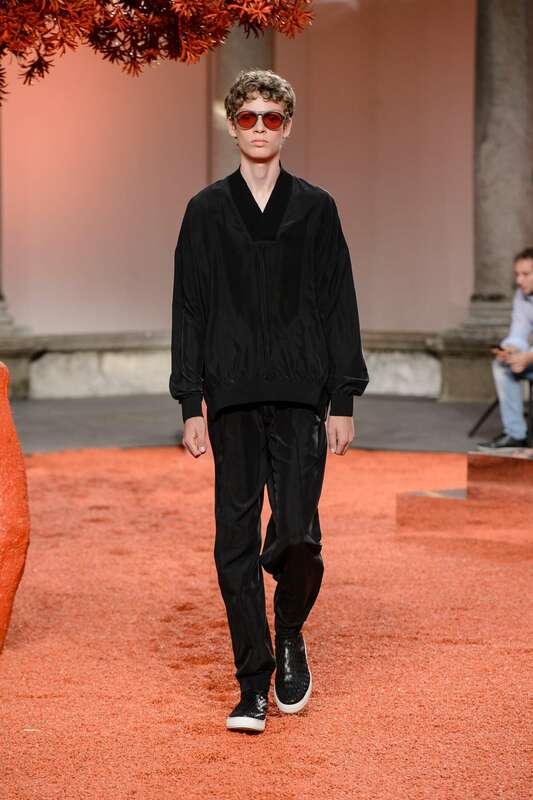 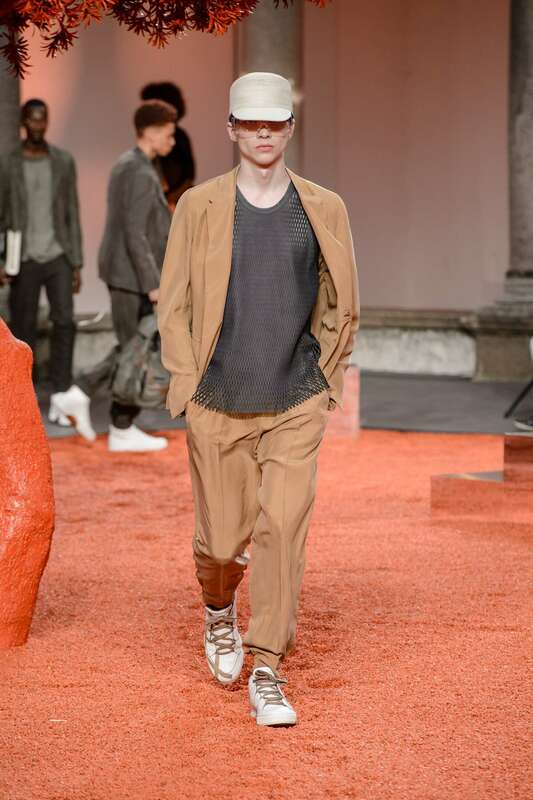 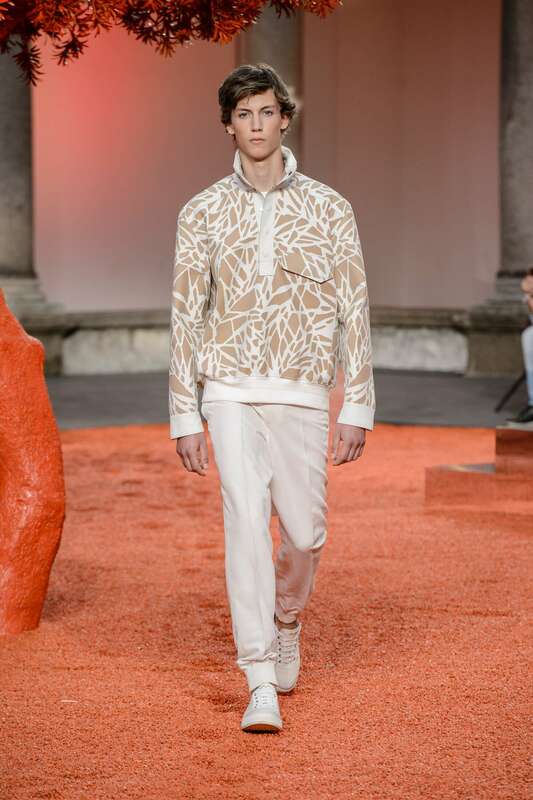 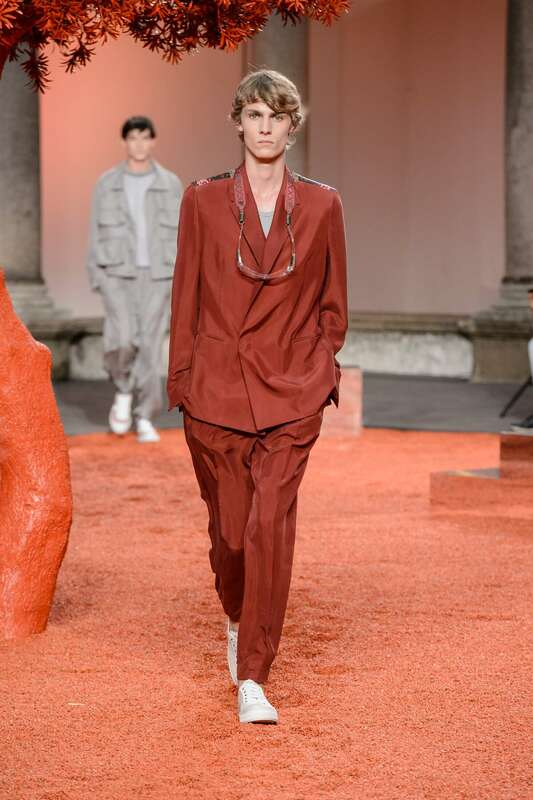 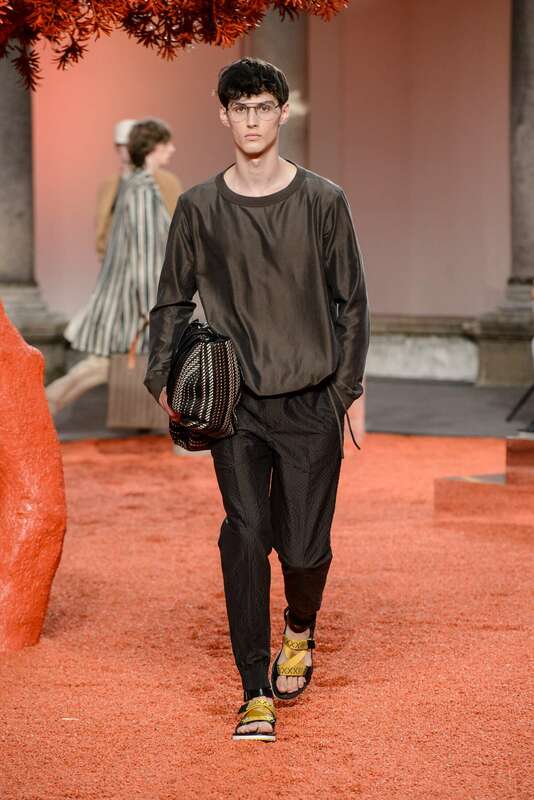 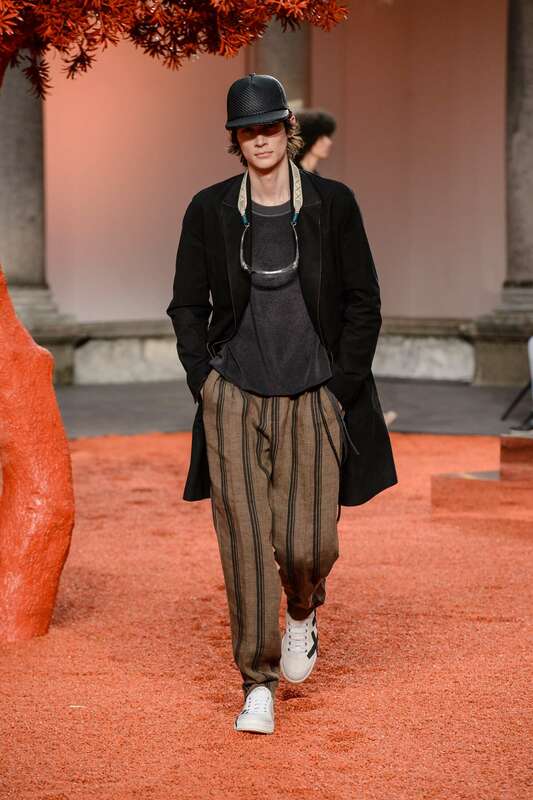 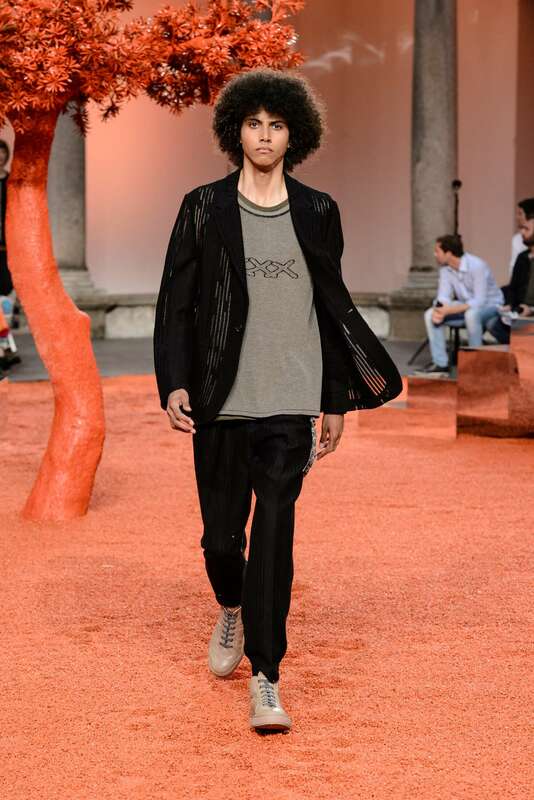 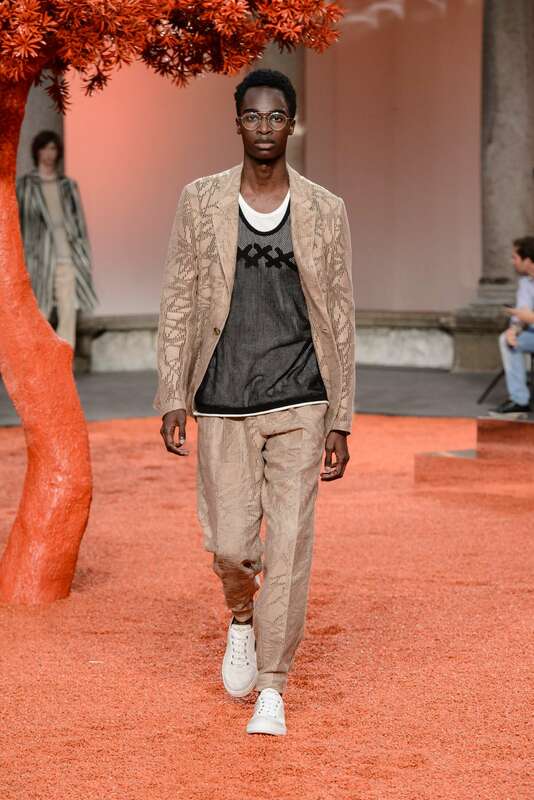 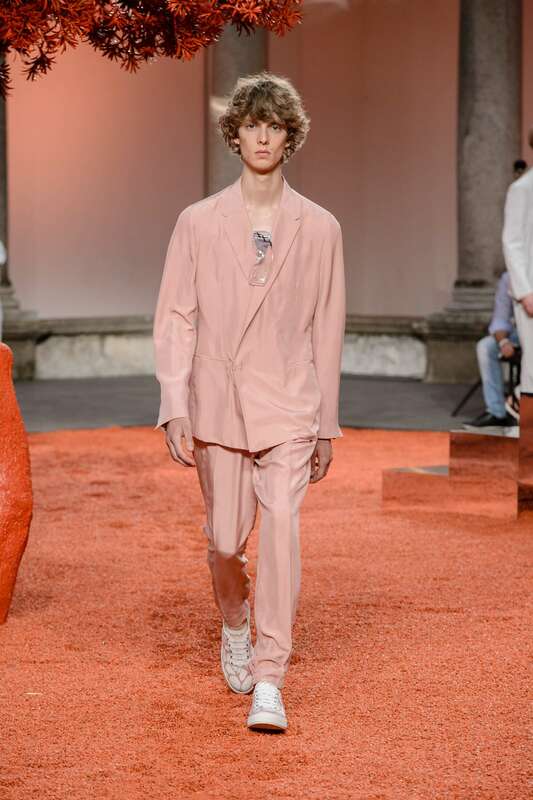 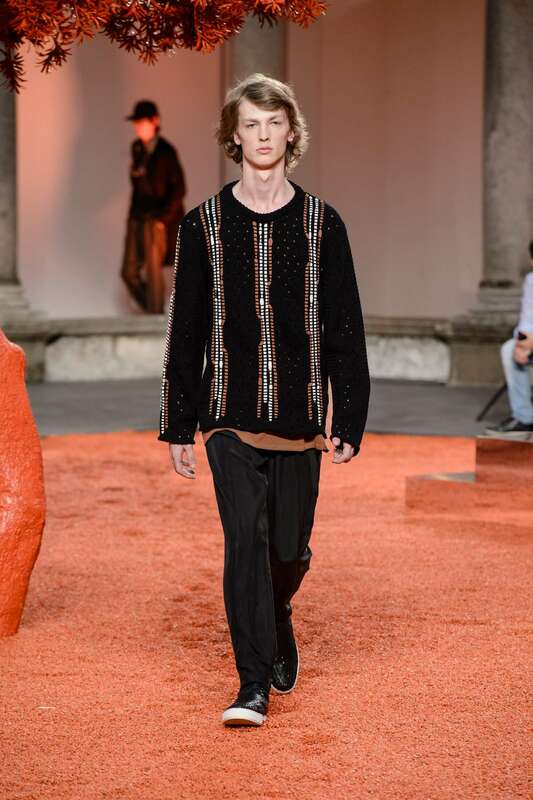 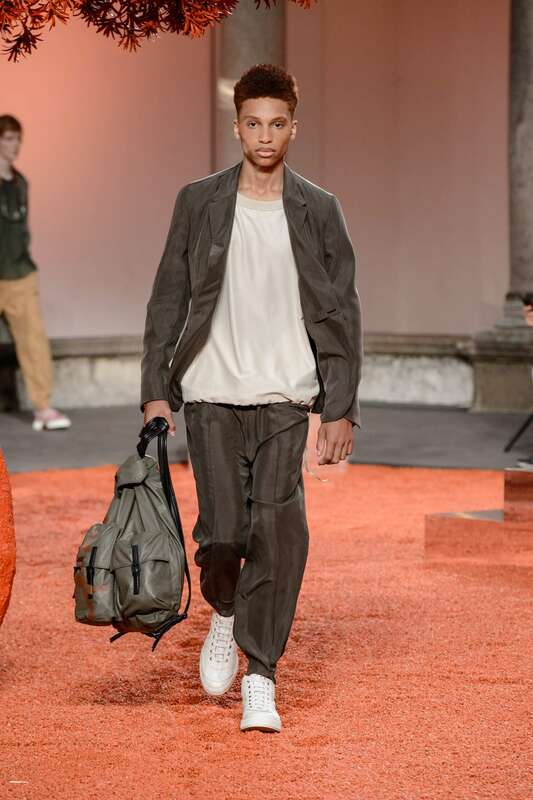 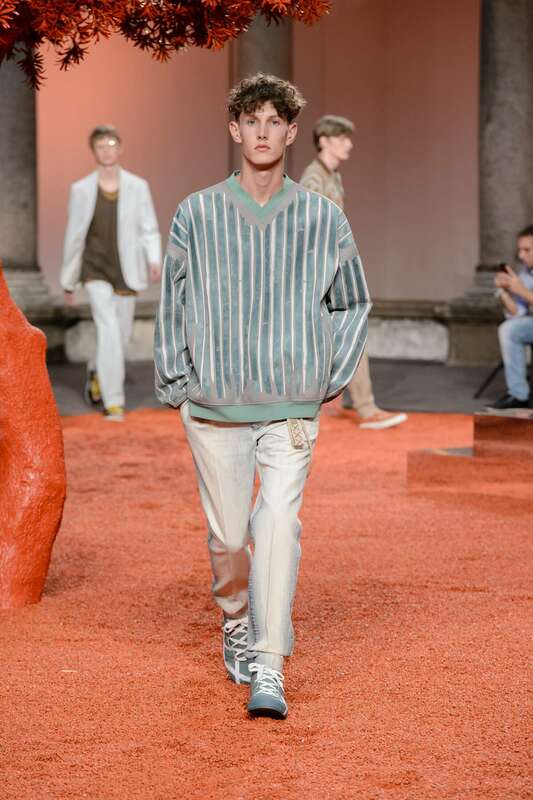 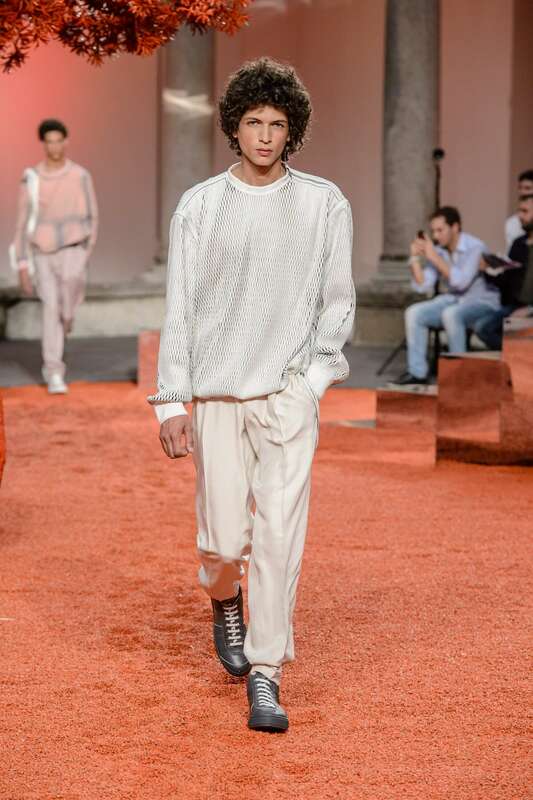 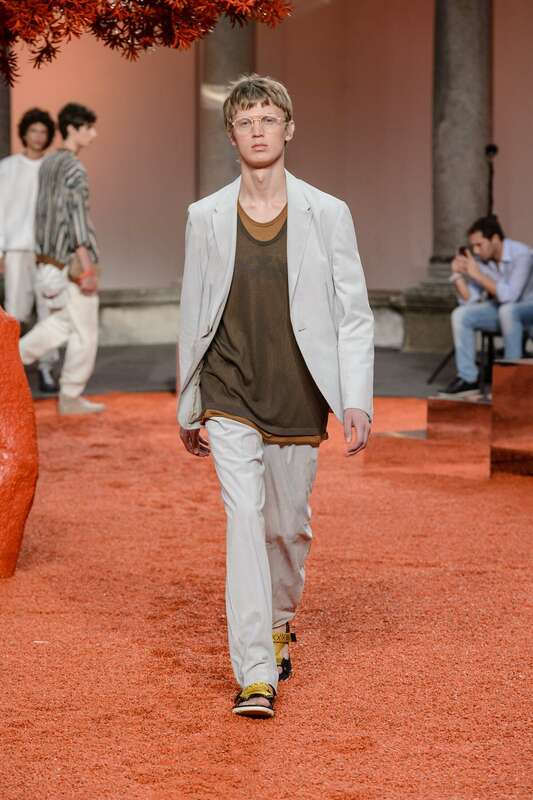 For his debut Summer collection, Artistic Director Alessandro Sartori is clashing innocence and sensual masculinity in an exploration of conscious and sub-conscious fantasies. 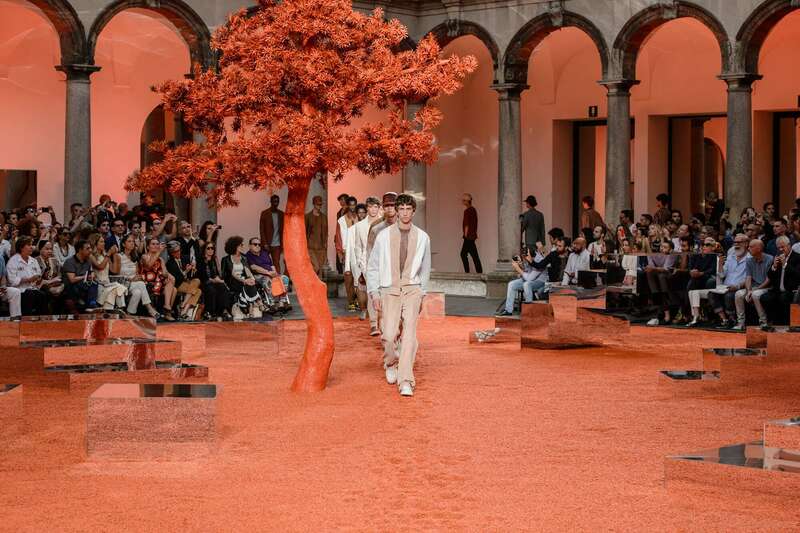 The linear backdrop of one of the historic courtyards of Milan’s Università Statale is the framework for a futuristic garden with tangerine lawns in a labyrinth of aesthetic compositions. 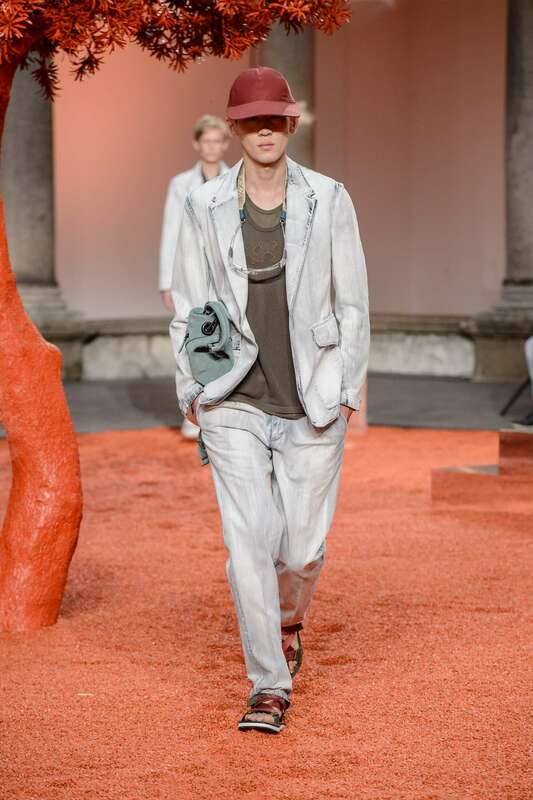 Outdoor life unexpectedly meets the indoor throughout a fresh summery breeze which pervades the fluidity of fabrics and delicate silhouettes enlightened by a blaze of colors. 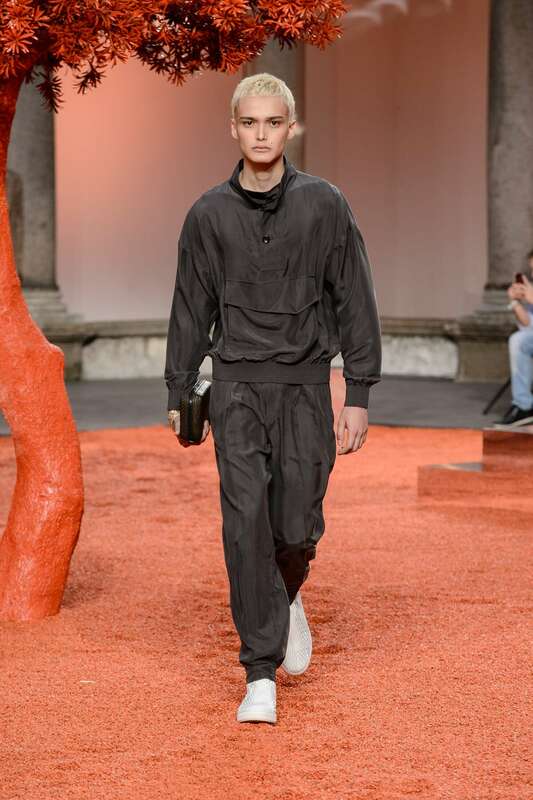 Couture constructions fly and inflate, moving with a carefree attitude. 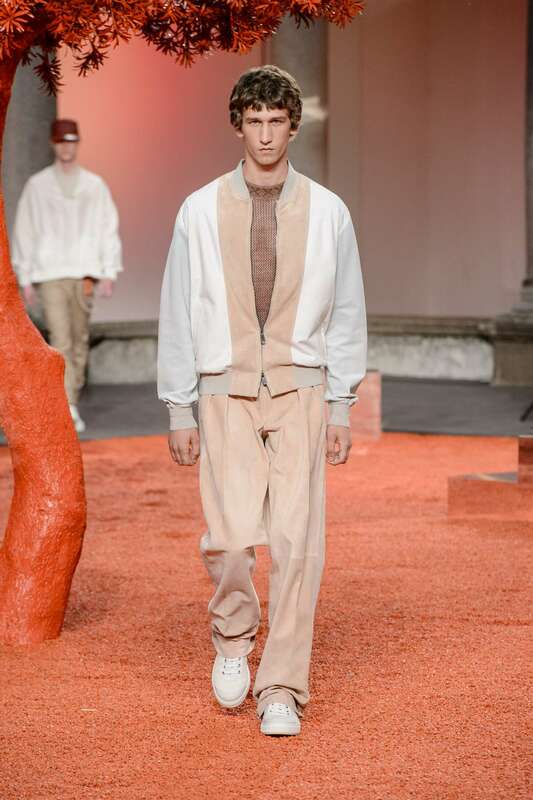 The interplay of proportions privileges uncommon freedom and ease replacing classic shirts with deconstructed tops in various volumes, doubled tank tops and scoop neck sweaters play with active yet tailored trousers and joggers. 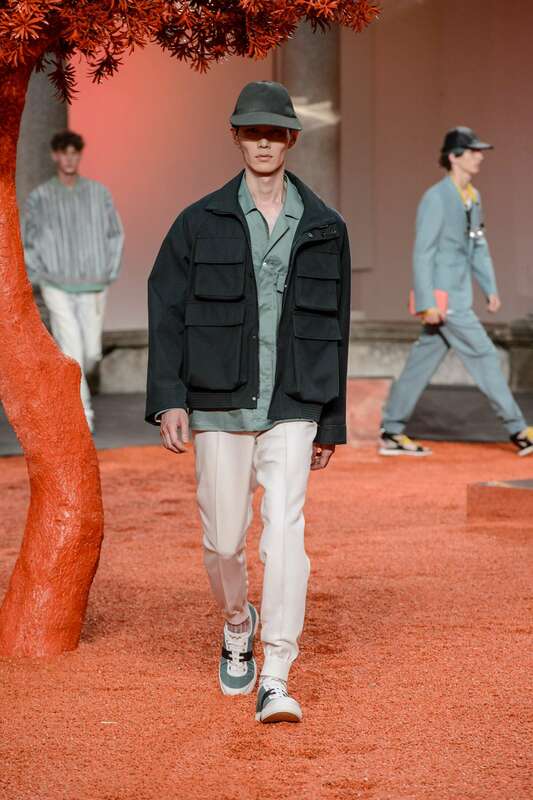 The studied assembly of sport-inspired clothing is enriched by oversized handmade pockets, hoods and iconic Triple Stitch logos, synonymous with Couture. 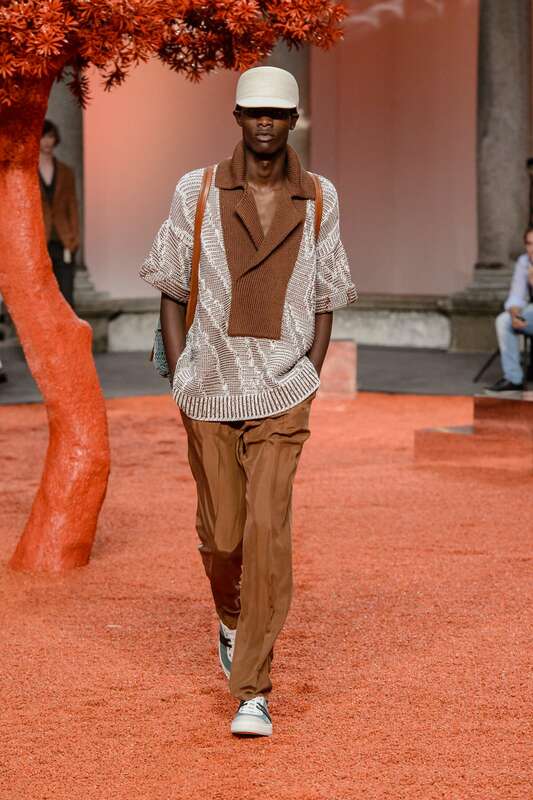 Fluid washed silks, Century Cashmere and pure mohair confer concrete weightlessness to the collection, while giro inglese and mesh jacquards, together with perforated and intarsia leather give hints of ethereal substance. 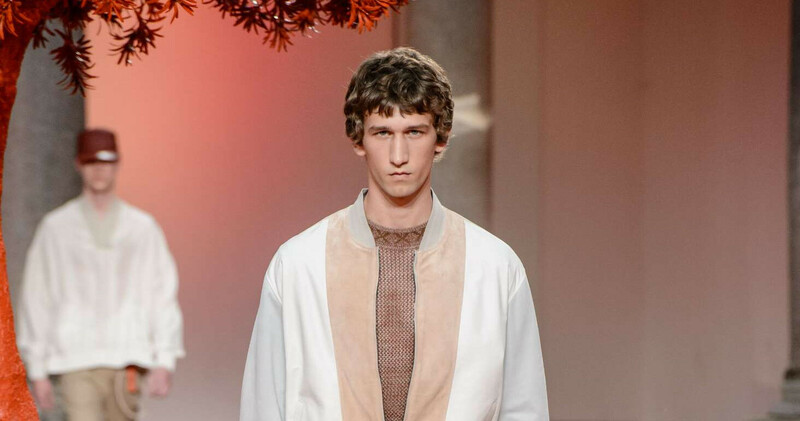 The delicate color palette favors natural shades of walnut, signature Vicuna, geranium, freesia, lotus, cypress and bleached aqua, while optical whites meet unexpected color flashes. 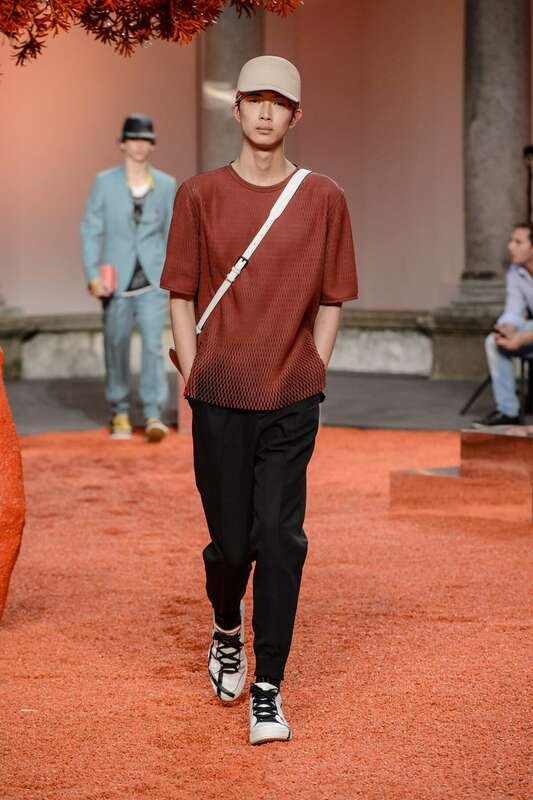 Even the accessories indulge in the laid-back pace of the season: technical Triple-stitch sandals, elasticated leather boots and iconic maxi-logo TIZIANO sneakers for footwear immediately available for purchase; and the super-soft evolution of PELLE TESSUTA™ in new, colorful knitted effects for bags, baseball hats and visors. 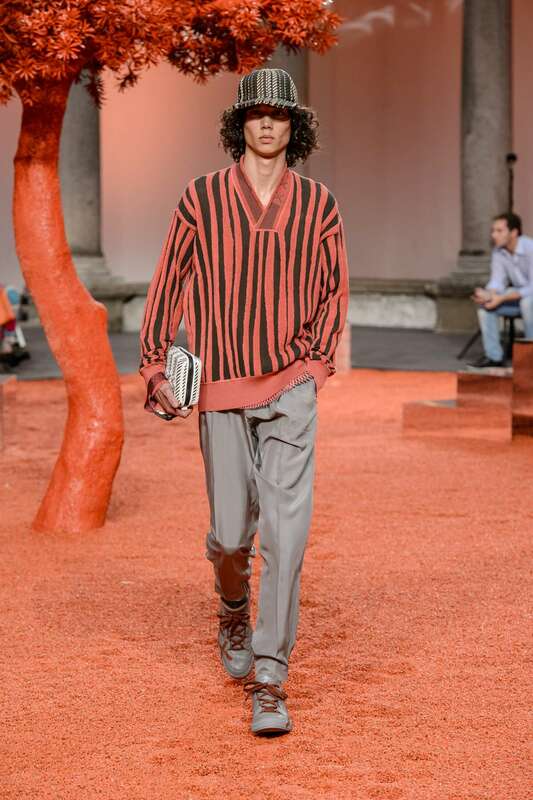 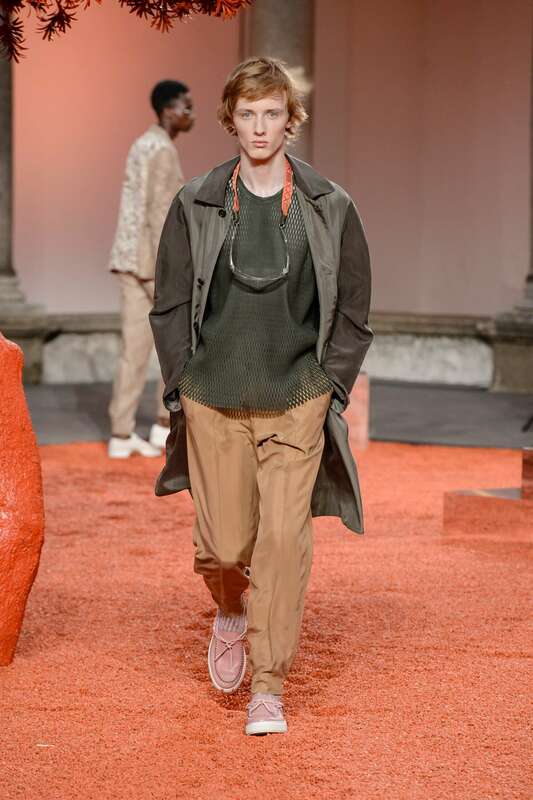 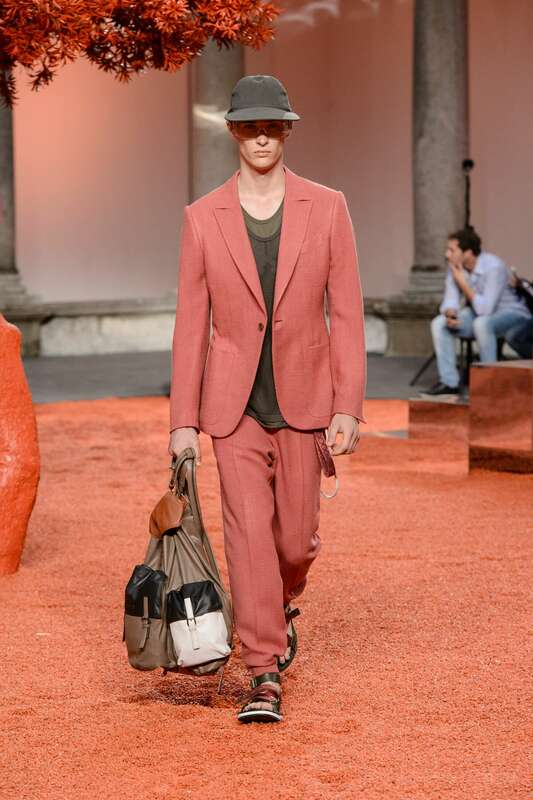 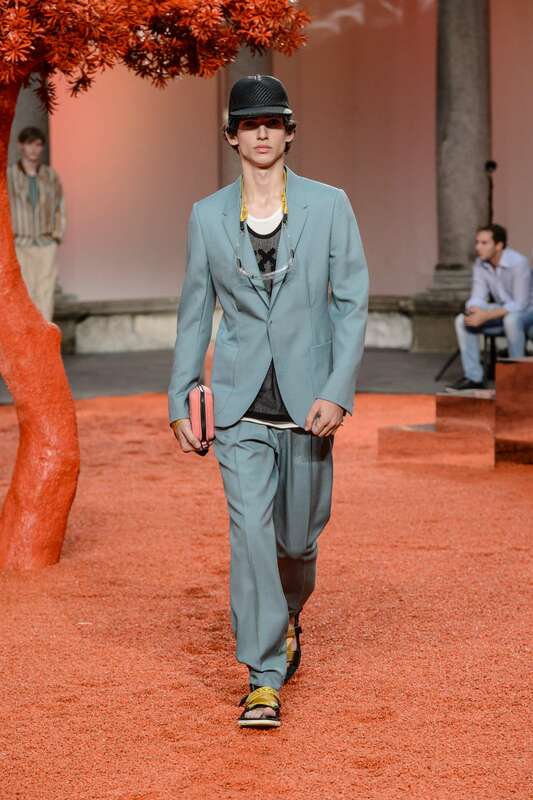 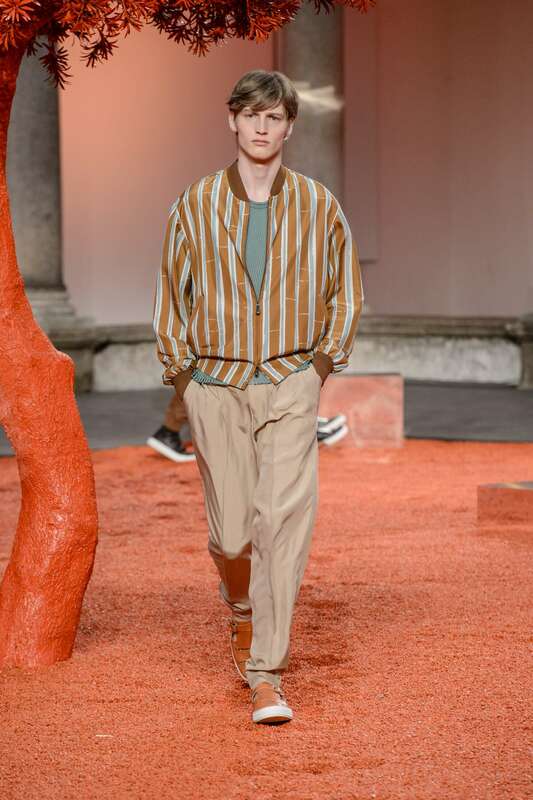 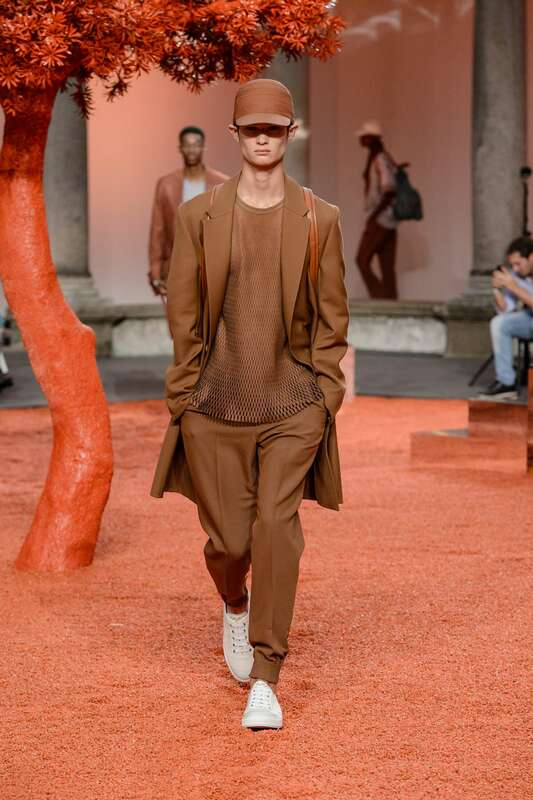 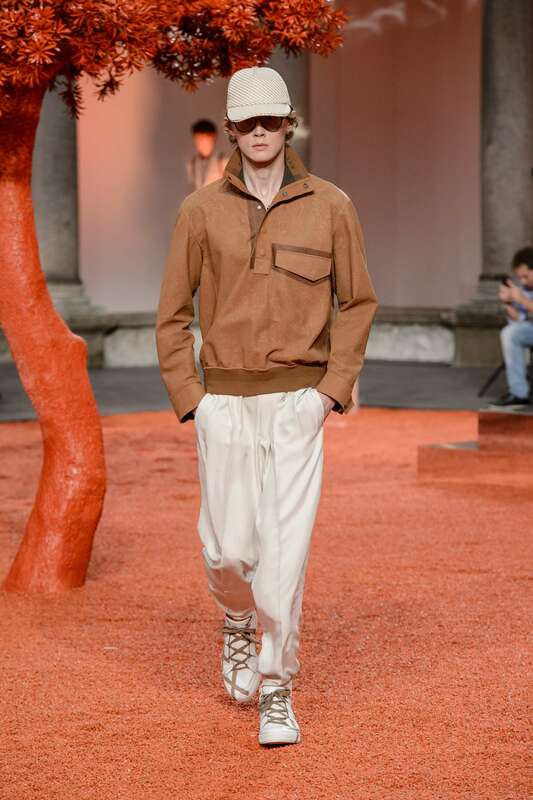 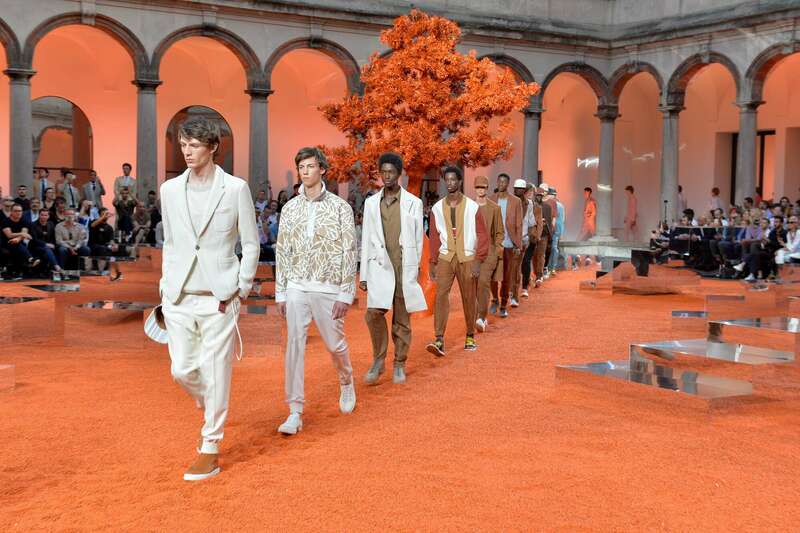 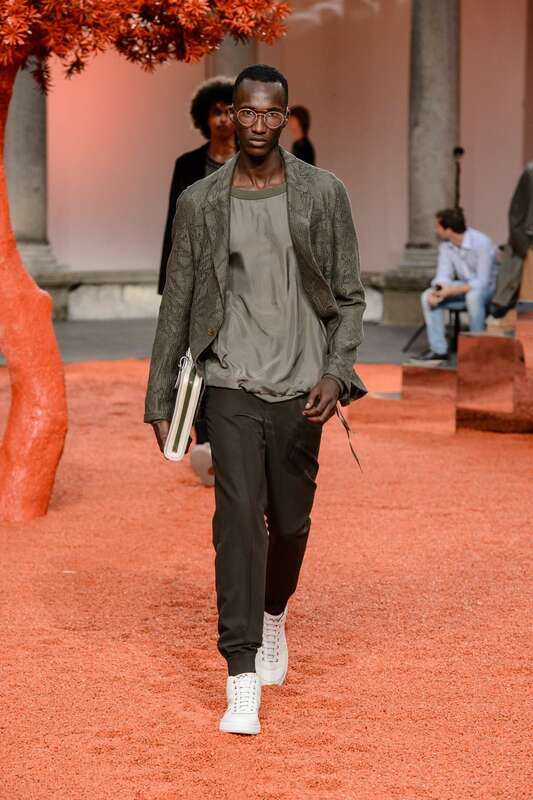 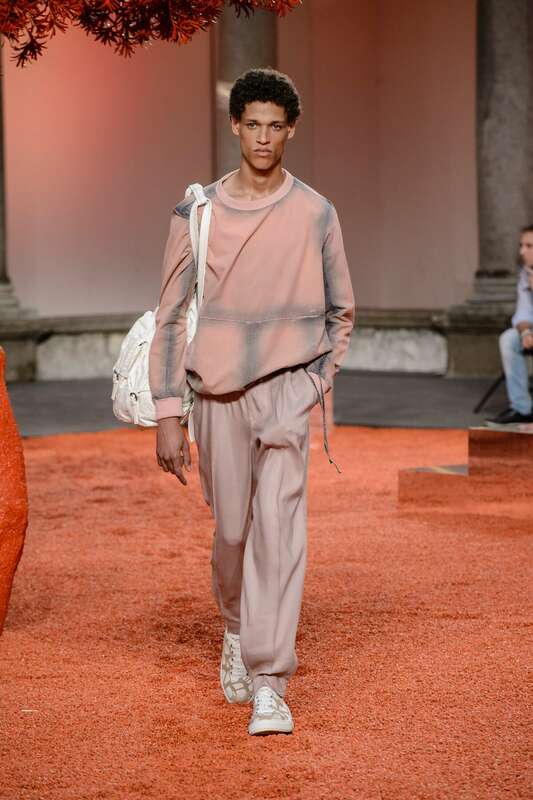 “To design a forward-looking men’s fashion wardrobe built around fluidity, freshness and color but enriched by the possibility of adding your own hint of personality and style, I couldn’t imagine a better place than this courtyard, where I often spent time in my youth reading, writing and sketching,” said Artistic Director Alessandro Sartori. 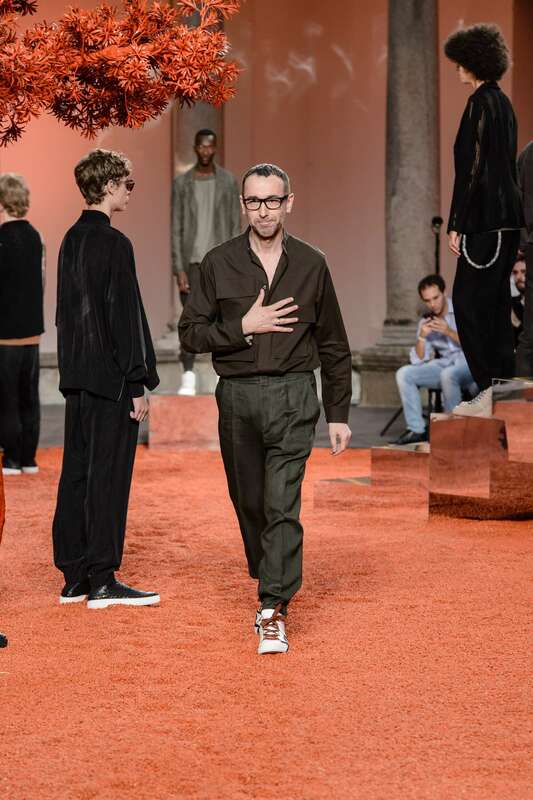 The day after the show, twelve of the Couture looks seen on the catwalk will be available to order Made-to-Measure in selected worldwide boutiques, with delivery scheduled within eight-weeks as per the rigorous atelier process. 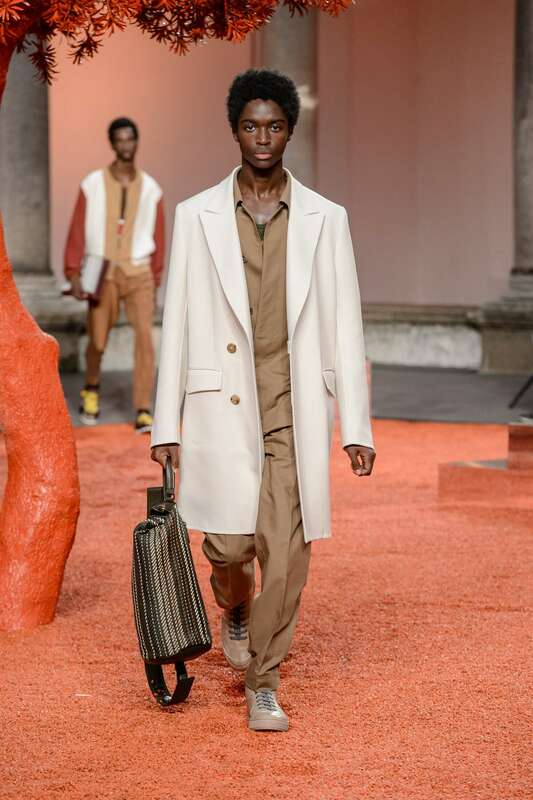 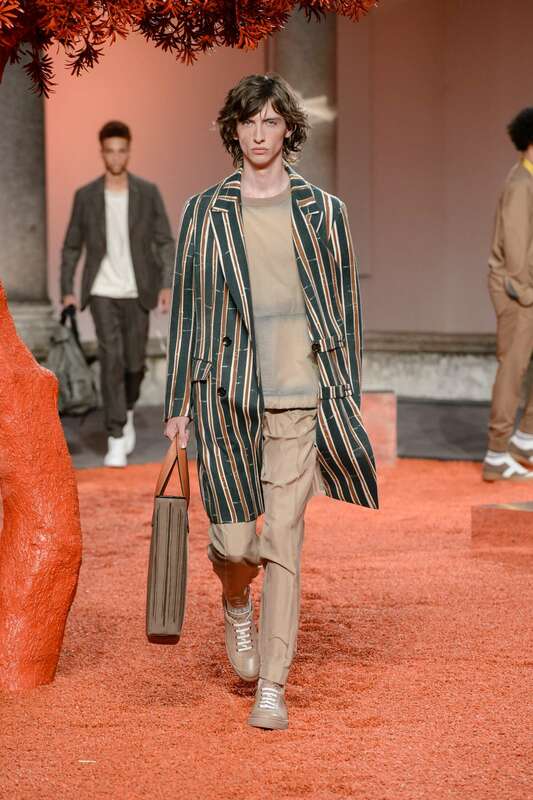 Yet it’s the degree of one-of-a-kind personalization, in which every single garment and accessory from the show is customizable with handmade knotting, painting and embroidery uniquely crafted by Zegna artisans, that reveals the true depth of Ermenegildo Zegna’s commitment to Bespoke. 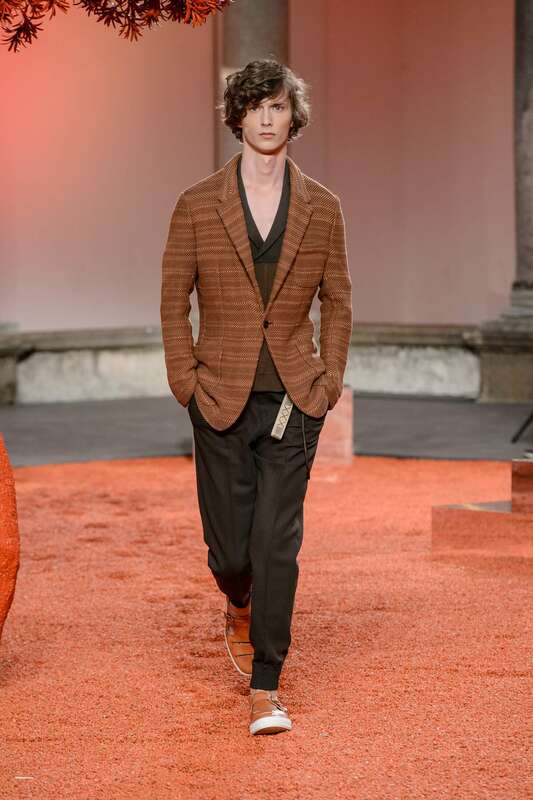 It is here, indeed, that the genuine Zegna values can be seen within every hand-made stitch.